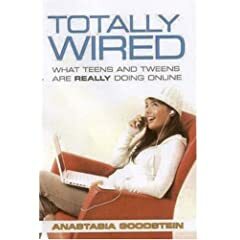 Totally Wired ‘ What Teens And Tweens Are Really Doing Online’ by Anastasia Goodstein. I picked up this book while doing research for a social networking brief, although it has a slightly American twist, i thought it’s content would still be fairly relevant. Anastasia Goodstein is a journalist and the main editor / creator of Ypulse – a youth marketing agency focused on everything youth – brands, technology, culture and lifestyle. She’s worked for major youth online and TV brands, including Current TV, AOL, and Oxygen TV as well as in non-profit youth media. The book’s broken down into various chapters covering the profile and networking use of a teen, through to technology and teaching, and finally how the future’s going to shape up. While some of the statistics are fairly out of date now, and some of the sites are no longer so popular, or replaced by equally popular social networking sites – The ideas behind teen usage online still stands. There’s real interviews with teenagers and industry professionals, as well as real-world examples of social networking usage. I took the time after reading the boook to go online and check out a number of the sites mentioned, One of the discussions in the book is about how kids really don’t understand how ‘public’ the net is. By simply going to xanga.com and checking recent articles – you can get a really clear example of this. Kids are using their online space to publish what used to be the equivalent of a personal diary – including posting emails originally from their parents for the entire world to see and comment on. I’m not going to give too much away because I think this is an incredibly good book, and certainly a must-read for any parent who’s thinking about joining their child online. It also serves as a warning for those adults wanting to be involved with what their kids are doing – but not wanting to infringe on their privacy. The book also touches cellphone and txting use, which are all part of the digital lifestyle. It’s important for marketers, and advertisers to understand how technically literate Kids are – and how important it is for them to ‘own’ their own space. We’re in strange times, there’s such a massive divide between the wired and ‘unwired’ generation It’s probably already too late for some agencies to understand the massive shift in media that’s happening, let alone catch up.